Broccoli is a plant of the Cabbage family, Brassicaceae (formerly Cruciferae). It is classified as the Italica Cultivar Group of the species Brassica oleracea. Broccoli possesses abundant fleshy flower heads, usually green in color, arranged in a tree-like fashion on branches sprouting from a thick, edible stalk. The large mass of flower heads is surrounded by leaves. Broccoli most closely resembles cauliflower, which is a different cultivar group of the same species, but broccoli is green rather than white. In the United States, the term refers exclusively to the form with a single large head. 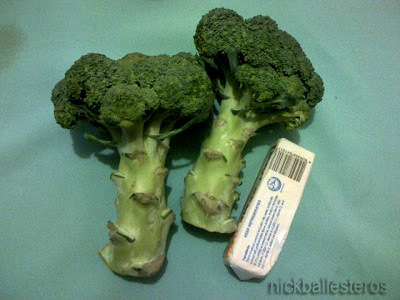 This form is sometimes called "Calabrese" in the United Kingdom, where sprouting (non-heading) types and those with underdeveloped flower buds are also sold as broccoli. Broccoli is high in vitamin C and soluble fiber and contains multiple nutrients with potent anti-cancer properties including diindolylmethane and selenium. The 3,3'-Diindolylmethane found in broccoli is a potent modulator of the innate immune response system with anti-viral, anti-bacterial and anti-cancer activity. Broccoli also contains the compound glucoraphanin, which can be processed into an anticancer compound sulforaphane, though the benefits of broccoli are greatly reduced if the vegetable is boiled more than ten minutes. A high intake of broccoli has been found to reduce the risk of aggressive prostate cancer. Broccoli leaf is also edible and contains far more betacarotene than the florets. Broccoli is usually boiled or steamed, but may be eaten raw and has become popular as a raw vegetable in hors-d'oeuvre trays. Although boiling has been shown to reduce the levels of suspected anticancer compounds in broccoli, other preparation methods such as steaming, microwaving, and stir-frying have been shown not to reduce the presence of these compounds. 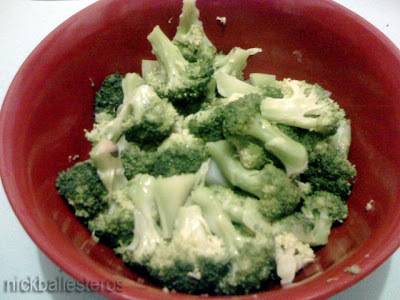 Even though we live in Baguio when we were kids, we did not have much of broccoli perhaps because... we just did not like it. We loved cauliflower though, and even scrambled for it when we had chopsuey on the dining table. My re-introduction to broccoli came in the form of the dish "beef broccoli" after college, and when I found out how expensive it can get in Manila, I buy either cauliflower or broccoli to bring back with me as pasalubong. Here's a simple recipe made by my wife that's so easy to make (done in under 5 minutes! ), and nutritious too! Break apart the green flower head by hand into manageable portions. Did you know that the stalk can also be eaten? Slice off the tough outer skin, then remove further the flesh under it until you get to the softer section. Slice diagonally. Wash. Broccoli is one of the favorite veggies at home! I love munching it too because it is one of those negative-calorie foods =) Thanks for the additional info! mirage2g: uy talaga? I also read that it's eaten raw... siguro masarap rin with salad dressing!